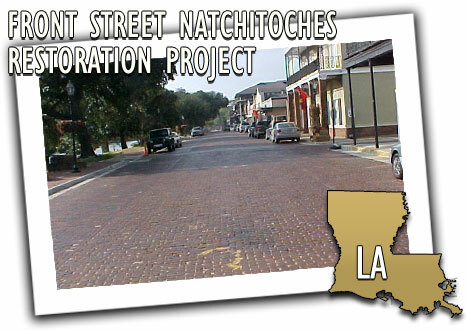 Six city blocks of brick-surfaced streets were rehabilitated in Natchitoches, the oldest settlement in the Louisiana Purchase, as part of the Front Street restoration project, managed by the Louisiana Department of Transportation and Development and the Front Street Task Force. The project included hand removing all of the approximately 300,000 roadway bricks, cleaning them, installing new underground drainage, a new stone base course and concrete pavement, replacing the pre-existing bricks on top of the concrete pavement, adding cross-walks across Front Street and on the side streets, and making all sidewalks ADA compliant. In order to keep businesses open along the street, the project was divided into three phases of two blocks each. During construction, numerous archaeological features were discovered including 18th and 19th century European and early American pottery, several pieces of Native American pottery, footings for 150-year-old buildings, trade beads, gun flints, horseshoes, animal bones, and a 1900 silver dollar from the New Orleans mint. Despite a number of obstacles, including Hurricane Gustav, the entire Front Street project was completed in the original contract time of 240 calendar days.